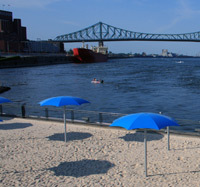 Last year we wrote about the massive reconstruction project in the Quartier des Spectacles - namely, a new plaza for the yearly Jazz Festival and similar events. One year has passed and the project bore its first visible (or, rather, walkable) fruit. 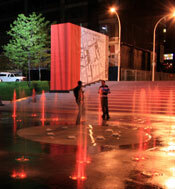 The $40-million Place des Festivals plaza was unveiled last month with an inaugural show featuring fluttering multi-colored water jets (a rather expensive spectacle, opined some local journalists) and packs of awe-stricken tourists enjoying the last warm days of Montreal’s short summer. The voting process for the name of Montreal’s citywide bike rental program is over and the winner is chosen. The system is going to be called “BIXI”.